In 2009, at a Jobs Summit, John Key, the Prime Minister of New Zealand, promoted the idea of creating a national cycle trail, going the length of New Zealand. 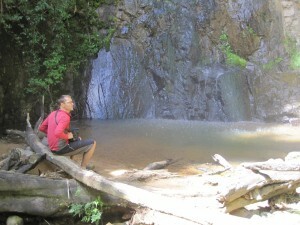 The idea was to create jobs during the building of the trails, and then attract tourism and money to New Zealand, in particular to small towns. Cycle tourists spend less per day than regular tourists, but they stay longer, so spend more overall. Apart from being a bit smelly, they are considered a good class of tourist to attract to a country. Once people started looking at the practicalities of implementation, the goals shifted a little. Rather than just aiming for a trail the length of the country, the plan now is to have a network of trails around the country, known as “Nga Haerenga (The Journeys)”. There will be showpiece “Great Rides” which are almost entirely off-road, and they will be linked up by sign-posted rides on quiet back roads. The “Great Rides” tend to take in old railway lines, or Department of Conservation land. This means that the location and direction of each of the Great Rides is all over the place, so it’s going to be tough to get them to link up in any meaningful fashion. We also have few roads in this country, so there may not be any quiet back roads available. Still, it’s a good start. Work has been proceeding all around the country, with some trails now fully open, others partly open, and others at the planning stages. I’m on summer holidays right now, so it seemed a good chance to check out some of the trails. After spending time with family, I was hoping to spend a week travelling around, doing some multi-day rides. Unfortunately it didn’t quite work out that way, so instead we decided to do a few day trips from Auckland. Unfortunately most of the trails are some distance away, but we found a couple where we could plan it into a longish day’s trip, with a bit of driving. 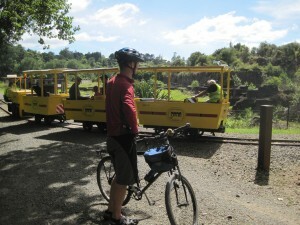 The first trail we tried was the Hauraki Rail Trail. This follows old railway lines from Thames to Te Aroha via Paeroa. 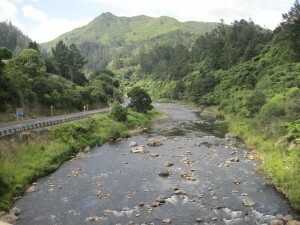 There is also a stub that runs from Paeroa to Waikino, via the Karangahake Gorge. Our plan was to drive to Paeroa, then ride from Paeroa to Waikino, back to Paeroa for lunch, then from Paeroa to Te Aroha and back, then return home the same day. Paeroa is a small town, famous for the springs that produce the water that goes into “L&P”, a local soft drink. These days it’s a stopping point between Tauranga and Auckland, most famous for the number of antique shops. Apparently it was also the winner of the “2012 NZ Community of the Year.” I have no idea what that involves, but the town was buzzing when we went through. It’s about 120km from Auckland, so it was an easy 1.5 hour drive down. We parked in the carpark near the rotunda and toilets, as you come in from the north on SH2. Tip here: Park near the trees, in a place where you will be shaded from the afternoon sun. Then the car is nice and cool when you come back all hot and sweaty. After gearing up, we headed off through the town, and joined onto the trail to Waikino. This heads up through the Karangahake Gorge. The trail itself is generally a fairly wide gravel path, following the old railway line. After starting out across farmland, it then goes up through a fantastic winding gorge, past the old gold processing battery. 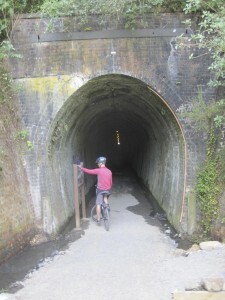 Along the way, the trail passes through an 1100m tunnel. You can see the light at the far end, but it never seems to get any closer. About halfway through, I thought “Maybe I should make a joke about how dark it is in here with my sunglasses on?” I turned around to say something to Anna…only to realise she’d been wearing her sunglasses the whole way. We do wear photo-chromic sunglasses when on the bikes, but they don’t go all THAT clear. Good thing there were some lights through the tunnel. This leg was very busy, with many walkers and cyclists out and about. Generally the trails are wide, so it’s no big deal, but you do need to watch where you’re going, and take care going around corners. We used our touring bikes, but a mountain bike would be fine too. You wouldn’t want to try it on very narrow tyres though. 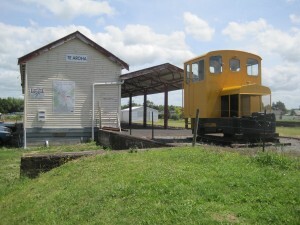 It’s 14km out to the Waikino railway station – good ice-creams and food here, I’m pleased to report. You can get the vintage train the next 7km to Waihi, if you want to push on to there. They are hoping to complete the bike trail through to Waihi – this would make for an interesting option for a two-day ride, going from Thames to Waihi, staying overnight, then riding Waihi -> Te Aroha. The trail is pretty flat – it is an old railway line after all – but you do notice the slight downhill heading back to Paeroa. Heaps of traffic passing through town by this time. I was happy to be on the bike, and not stuck in a hot car. I’ve never found any outstanding eating options in Paeroa, but the L&P Cafe wasn’t too bad. We stopped there for lunch, relaxing a bit, before heading out of town again, this time to Te Aroha. 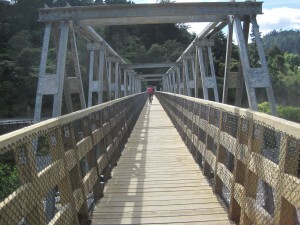 This section of trail follows an old railway line through farmland for 21km from Paeroa to Te Aroha. There were few riders on this section, and it’s understandable why, as it’s not as “exciting” scenery-wise, as the Waikino leg. The surface shows that it hasn’t had many riders, and in some places is a bit soft. But I’m pleased we did it. It would have been nice to have had a little more time to explore Te Aroha, but we were a little pressed for time, so we just took a break from the hot sun, had a cold drink, and turned around to head back to Paeroa. Since it wasn’t so exciting, I took to counting the cattle grids we had to ride over – I counted 49 cattle grids. You get sick of bumping over those – would have been nicer to have had suspension then! We were pretty hot and tired by the time we got back to the car, for the drive home.